Contains survival items that fulfill the following needs: food/water, first aid, emergency tools, hygiene, communication, lighting and shelter. Includes a Solar/Hand-Crank Powered Radio/Flashlight that broadcasts the NOAA Weather Band Alert system and features a built-in USB port to charge your cell phone. 3 day/2 person (6 day 1 person) supply of Food/Water is U.S. Coast Guard certified to remain fresh for up to 5 years even when exposed to extreme temperature fluctuations. Supplies packed in a durable, military grade black backpack for portability and endurance. For ultimate disaster preparation store this bag in your vehicle or office and keep an ER™ Home Survival Kit in your home to ensure you will always have supplies on hand. First aid supplies include advanced trauma gauze designed to quickly stop profuse bleeding. Includes a 10 in 1 multi-use hammer tool and compact shovel to add in shelter building, search & rescue operations and food preparation. Why do you need a bug-out bag? The Bug-Out Bag contains essential supplies needed while traveling to a safe-zone. 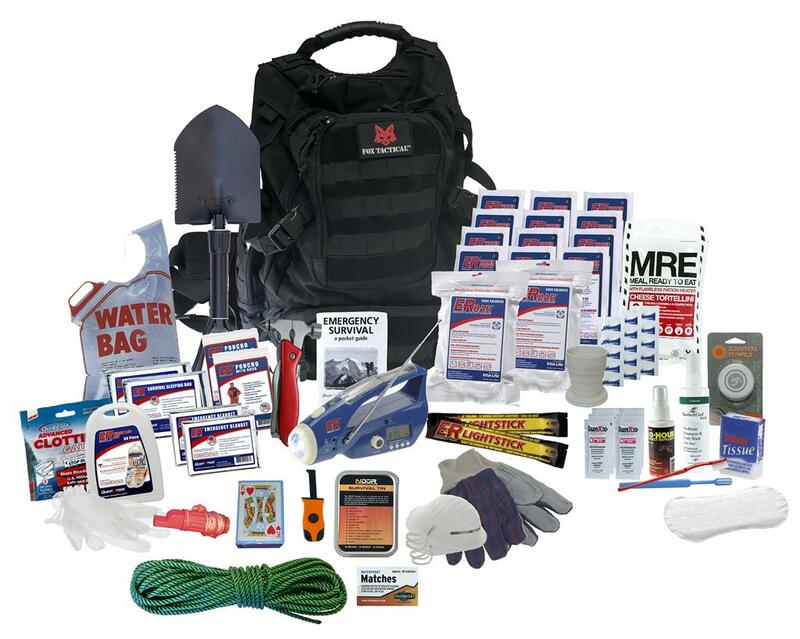 This kit is intended to supplement your shelter-in-place supplies. If an extreme emergency occurs while you are away from home, you will require supplies to sustain you until you reach your shelter-in-place cache or an evacuation zone. The portability and comprehensiveness of this kit ensures you have the necessary supplies for any contingency whether it be braving the elements, evacuating miles on foot or treating a first aid emergency on the road. *Replace expired items with the ER™ 2-Person Easy Replacement Pack. The Emergency Ready Bug-Out Bag is the most comprehensive grab and go bag on the market. This bag contains essential supplies to aid you and your family in the event of an immediate evacuation. The Bug-Out Bag will fulfill needs for shelter, food/water, search & rescue, communication, lighting, hygiene and first aid. The ER Bug-Out Bag is durable enough for any environment. It contains food and water that can be stored in areas that experience extreme temperature fluctuations such as inside a vehicle. Keep this bag in your vehicles, office or home. You are not going to want to be without this bag when disaster strikes.